In recent years, the latter, “sparse” conception of memory, in which at most a few thousand neurons are activated by any given memory, seems to be gaining the upper hand, or at least that is what I gather from two recent articles touting its merits. The first appeared in the June 2017 issue of Spectrum, a journal on brain modelling and artificial intelligence and is entitled “What Intelligent Machines Need to Learn From the Neocortex”. Its author, Jeff Hawkins, identifies three aspects of brain physiology that artificial intelligence would do well to adopt: constant rewiring of the circuits (as Hawkins tells us, up to 40% of the synapses on a neuron are replaced with new ones every day), the fact that the brain and the body form a single whole (an “embodiment”), and the sparse form of neuronal representations that we will be discussing here. Hawkins says that these representations have at least two properties that are of great interest for memory. The first is that the relatively small number of neurons corresponding to a concept means that there can be specific overlaps among various assemblies of neurons. 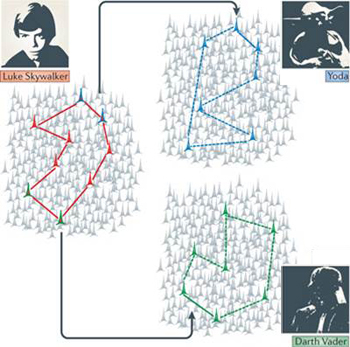 The neuronal assemblies for concepts that evoke similar realities (Luke Skywalker and Yoda, in the figure above) may thus have some neurons in common. These shared neurons would explain why, when you think of one such concept (Luke, for example), others (such as Yoda) tend to come to mind as well. Lastly, Hawkins notes that unlike models involving millions of broadly distributed neurons, these sparse representations enable us to differentiate similar concepts so that they do not interfere with one another in the many fluid or uncertain situations that we have to evaluate every day. The other body of data supporting the sparse concept of the networks of neurons selected by a memory comes from the work of scientists such as Rodrigo Quian Quiroga, who was Ginger Campbell’s guest on one of his recent Brain Science Podcasts. Quiroga is the author of a book entitled The Forgetting Machine: Memory, Perception, and the “Jennifer Aniston Neuron”. which presents the discoveries that his team has made concerning what are now known as “concept cells”. By implanting microelectrodes directly in the hippocampi of epilepsy patients to monitor neural activity before they underwent ablation of a seizure focus, the team identified some neurons that became activated in a highly specific way—for instance, when these individuals were shown a photo of the American actress Jennifer Aniston. Even more interestingly, these neurons became just as activated when the subjects were shown photos of this actress taken from various angles as when they saw her name written down or heard her voice! In short, these neurons seemed to be involved not in the details of the various stimuli associated with Jennifer Aniston, but rather in the concept of Jennifer Aniston herself. Several fascinating aspects of these experiments are also reported in a 2013 article in Scientific American, entitled “Brain Cells for Grandmother”, an allusion to an old and somewhat facetious form of the idea that each of us has a neuron that reacts to our grandmother and to her alone. But in fact, that’s not so far from the truth. First, as this article reports, we donâ€™t literally have just one neuron that responds to the idea of our grandmother, but rather a small population of neurons that do so. Second, as Quiroga has shown, such neurons may also respond to very similar concepts (in the case of the “Jennifer Aniston neuron(s)”, for example, to one of the other actresses on the show Friends, but not to the cast as a whole). Third, these neurons are located not in the temporal visual regions of the cortex (such as the fusiform face area, whose neurons are strongly activated when we see faces, but not just any face), but rather in the hippocampus. And fourthly, such sparse assemblies of neurons can be created very quickly: for example, in one subject, a neuron began to respond very strongly to Dr. Quiroga just two days after the subject had met him, which is quite consistent with our ability to remember new things very rapidly. For all these reasons, and for many others that have been discussed since the discovery of conceptual neurons in 2005, these sparse assemblies of neurons seem to be a highly economical, fast and flexible way of encoding what is ultimately most important to us: the meaning that the people and things we encounter has for us. When we want to remember their detailed characteristics, we can then go look in the billions of other neurons in our cortex where many of them are probably encoded. But the key concepts that make our abstract thinking so fluid are not burdened with details and instead form spontaneous associations according to their semantic proximity, and, one might almost say, their neuronal proximity as well!